It has been a busy last patch with Homme House, Aston and Hartpury all in very quick succession. For me, Homme House was an event for the 5yr olds, and Noor had some of her horses there. Josh was also at the event on the second day with four horses to ride. Homme had done loads to the ground and with educational tracks everything was very worth while. 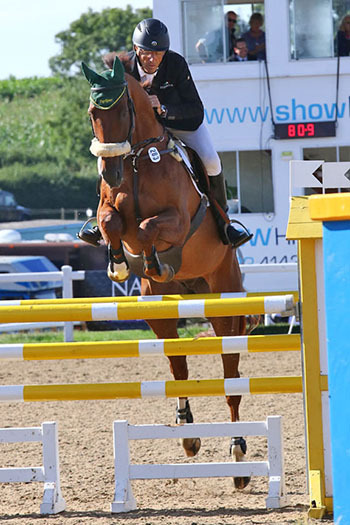 Josh had an enjoyable day with some good minor placings – he seems to be really enjoying his riding this summer. Both Noor and I had mixed days, some good some not so good. Aston was another chance to get Womble out and about and do a dressage and showjump round. Nigel Taylor, as ever, had made decent ground. Quinn got the chance to have another go at intermediate which he handled with ease. It was also a big day for Noor as she was doing her first intermediate on Chicken. Noor gave Chicken the best ride she could have and went clear across country and just had a couple down in the showjumping. Next it was off to Hartpury for Noor and Laria in the one star, Bert in the two star and Alex, Womble and Sparkles in the three star. All the courses were really good I thought, being strong but inviting, and with the arrival of the rain lots of people that might not have run, did run their horses. I think Angus Smales will develop into a good course designer as he has a good feeling for the job and has ridden at the highest level. He certainly produced good courses this week. Laria did a great job, finishing her first one star with a clear inside the time cross country and one showjump down. Noor was very unlucky, getting to the second last cross country fence, having done all the hard combinations, and parting company with Tonic. There will be other days for them – this year has been a difficult year with Noor’s learning curve very steep. Bert was a good boy, giving me a great ride cross country. Unfortunately an overreach meant he could not trot up on the last day. But there will be other times for Bert. All the three star boys went double clear, with Womble, Alex and Sparkles placing well, Sparkles (pictured) the best of them coming 5th out of a big field. So it will be a busy time again for a few weeks and then hopefully things will settle down.